When we think about human rights we often think of physical well-being and immediate needs, like food, water, and safety. 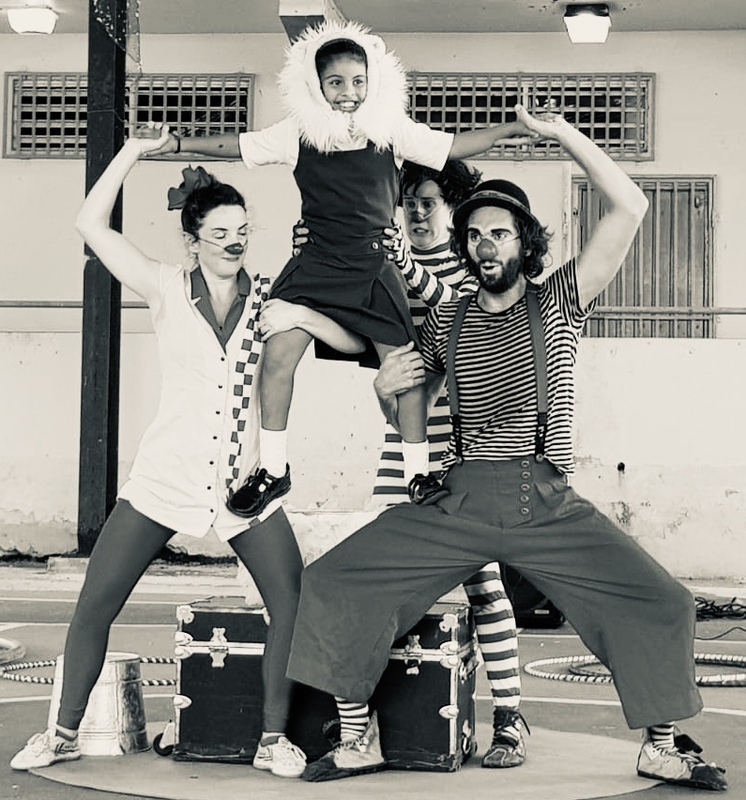 At Clowns Without Borders, when we think about human rights, we focus on the right to play. Yes, the right to play. Just as everyone is entitled to freedom from slavery and torture, freedom of opinion, and the right to food, everyone is also entitled to the right to play. Article 24 of the Universal Declaration of Human Rights is the Right to Play. Of course, play is more than a moment of joy. Play is how children learn. 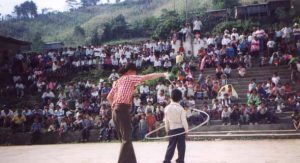 Just like clowns, children try on different roles, acting out the scenarios and relationships they see modeled around them. Play is how they challenge each other, create imaginary worlds, and discover their own strengths. On November 20, 1959, the UN General Assembly adopted the Declaration of the Rights of the Child. Thirty years later, the UN adopted the Convention of the Rights of the Child. In addition to special protections for children, it’s the first international treaty that explicitly extends human rights to children. Today, Universal Children’s Day 2018, we celebrate the children who had the idea for Clowns Without Borders. That’s right, the idea for CWB came from children! Children in a Balkan-region refugee camp wrote to children in Spain, “We’re okay. We have food. We have shelter. We have medicine. 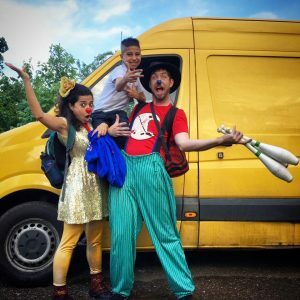 But what we miss is laughter.” Long story short, the kids in Spain found a clown (Tortell Poltrona) and suggested that he offer a free performance to their new friends. Voila, Clowns Without Borders was born. 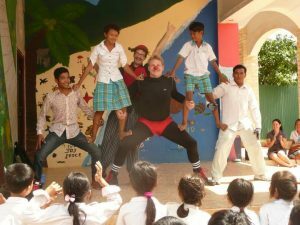 Clowns Without Borders exists because Tortell trusted the wisdom and creativity of children. To this day, CWB seeks to emulate and reinforce that trust in each performance. When we train new artists, we emphasize an ethos of “lifting up the child” (often literally!). This means that it’s the child, not the clown, who’s the star of the show. It’s the child, not the clown, who sets the pace and discovers many of the punchlines. Lift the child up—you can see this in pictures of kids on shoulders, kids on buckets, kids on stage. Some of our best performance moments, spontaneous and planned, happen when we invite our young audience members onstage and let them have the spotlight. For children, play is education. Join us as we promote this right. Excellent article Naomi! Does a great job of explaining your mission. Thanks!